Article III, Section 1, of the Constitution establishes the judicial branch of the federal government, stating that “the judicial power of the United States shall be vested in one supreme Court, and in such inferior Courts as the Congress may from time to time ordain and establish.” These courts are supposed to serve as guardians of the Constitution and federal statutes. In its present form, the federal judiciary is comprised of three main tiers of courts: 94 district courts, 13 courts of appeals, and the United States Supreme Court. The United States District Courts are the federal judiciary’s trial courts. Each court has at least one District Judge, who is nominated by the President and confirmed by the Senate. District court judges enjoy life tenure, as mandated by Article III. Currently, there are over 670 district judgeships authorized by Congress. District courts hear both criminal and civil cases, though their jurisdiction is limited to disputes that involve an actual “case or controversy.” Additionally, the dispute must involve a constitutional provision or federal law (as opposed to a state law) or be between litigants residing in different states (or where one party is a citizen of another country). 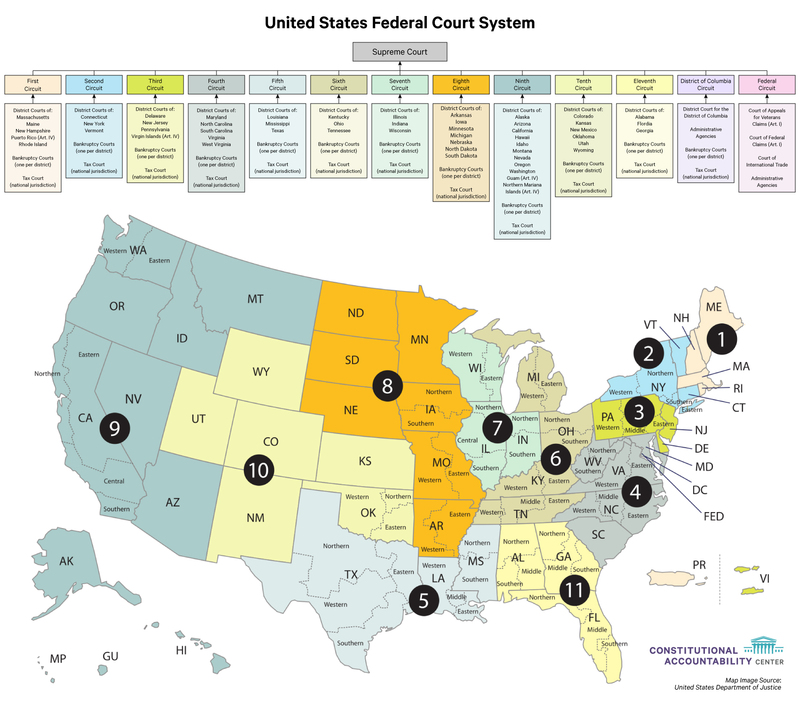 The United States Circuit Courts of Appeals include 12 courts representing geographical regions (eleven numbered circuits and the District of Columbia) as well as the Federal Circuit Court of Appeals. Multiple judges serve on each circuit, ranging from six on the First Circuit to 29 on the Ninth Circuit. Like district judges, circuit judges are nominated by the President, confirmed by the Senate, and enjoy life tenure in accordance with Article III of the Constitution. When a district court decides a case, litigants may appeal the decision to the corresponding appellate court. For example, a case decided by the District Court for the Eastern District of Texas would be appealed to the Court of Appeals for the Fifth Circuit, which includes all districts in Texas, Louisiana, and Mississippi. There are some types of cases, however, such as some rulings by federal agencies, that are brought directly to circuit courts. Each case is assigned to a “panel” of three judges. All parties in the case submit briefs to the court presenting their legal arguments for why the lower court ruling should be upheld or struck down. Individuals and groups who are not directly involved in the litigation, but who have an interest in the outcome of a case may — with the permission of the parties or the court — file amicus curiae (Latin for “friend of the court”) briefs. Amicus briefs allow third parties to present additional legal arguments for the court to consider that may not have been presented by the parties to the case. Once all briefs are filed, the court often hears “oral argument,” in which attorneys for each side appear before the court to present their arguments orally and answer questions from the judges. At some point after hearing oral argument, the panel issues its decision, often in the form of a written “opinion” that will bind that circuit court and district courts within it. On rare occasions, the court may also hear the case en banc, where a larger panel of judges (the number varies by circuit) reviews the district court decision. En banc hearings generally involve cases of significant public importance or are aimed at ensuring consistency with the circuit’s rulings in prior cases. The Supreme Court is the highest court in the United States judicial system. It is comprised of one Chief Justice and eight Associate Justices, who, like other federal judges, are nominated by the president, confirmed by the Senate, and enjoy life tenure. The Supreme Court has jurisdiction over all cases brought in federal court, as well as those decided by a state supreme court on the basis of federal law. Its rulings are the final word on legal matters brought before it. The Supreme Court also has “original jurisdiction” in certain types of cases, such as disputes between states. In “original jurisdiction” cases, the case is brought directly to the Supreme Court rather than to a district or circuit court. Once a circuit court or state supreme court has issued a ruling in a case, either party can appeal the decision to the Supreme Court by filing a petition for a writ of certiorari. While circuit courts are required to hear appeals, the Supreme Court is not, and it can — except in specific circumstances defined by statute — refuse to hear a case entirely. At this point, also called the “cert stage,” interested groups and individuals may also file amicus briefs encouraging the Court to either hear or reject the petition. Four justices must agree to hear a case for the Court to grant cert. If there are not four votes in favor of granting cert, the petition is denied, and the lower court’s ruling stands. Importantly, the Court’s decision to deny cert is not a decision on the merits, that is, it is not a decision that the lower court decision is right. Over 7,000 petitions are filed with the Supreme Court each year, and in recent years, the Court has granted only 70-80 of them (less than 1%), meaning circuit courts have the final say in the vast majority of cases. If four Justices do agree to hear a case and put it on the Court’s “merits” calendar, the parties and any interested amici will file “merits” briefs that provide arguments about how the Court should rule. The Court will also hear oral argument in the case. At oral argument, the parties (and sometimes the United States government) will present their arguments and respond to any questions the Justices may have. After oral argument, the Justices discuss the case behind closed doors and vote on which way to rule. The most senior Justice in the majority then assigns someone from that group to write the Court’s “majority opinion” — its final decision in the case. Justices who disagree with the majority may write a “dissenting opinion” or join one written by another Justice. Additionally, Justices who agree with the majority but disagree with its reasoning may write a “concurring opinion” stating the rationale they would have preferred. Notably, Justices can change their votes after that initial conference, although that happens only rarely. The Supreme Court’s Term begins on the first October of every year, and continues until late June , at which point it recesses for the summer. Opinions in pending cases are generally issued by the last day of the Term in which the Court agreed to hear them, if not sooner.